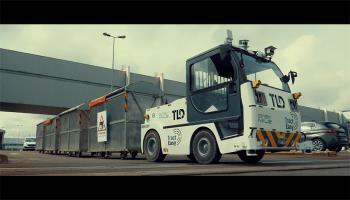 TractEasy is a driverless tow tractor with a maximum capacity of 25 tonnes and the ability to drive among other vehicles at speeds of up to 25 km/h. Developed by EasyMile in partnership with TLD, TractEasy improves operational flexibility at manufacturing plants, airports and logistics centres. In PSA’s Sochaux facility the TractEasy drives up to 15km/h – the current speed limit there – on a 3 km circuit and makes round trips between the supplier industrial park and the assembly shop. Following the initial trials successfully conducted with the vehicle last May, a ‘connected’ road will be built this autumn to take testing a step further. It will enable TractEasy to communicate more effectively with road infrastructure, such as traffic lights, doors and level crossings to optimise the logistic loop within the traffic. Following this step, the plant plans to operate two autonomous tow tractors in the first quarter of 2019. They will operate in shifts on a 24/7 basis to deliver parts from the supplier industrial park to the 3008 assembly line. Ultimately, they would be able to deliver all of the parts used to build the 308 and 3008, including the bumpers, tailgate and consoles. A world first in the manufacturing industry, this technology is one illustration of the ‘4.0 solutions’ that the Sochaux plant has decided to adopt ahead of schedule in its Sochaux 2022 future’s plant project. The plant offers a wide variety of real-life test scenarios, with rail lines, intersections, traffic lights and one-way roads. The solution set up on this test circuit and the adjustments it requires can be easily transposed to other circuits and other locations. Sochaux plant produces 2,100 vehicles per day for the 308 and 3008 and Opel Grandland X line-ups. Testing is being conducted in cooperation with EasyMile as part of Groupe PSA’s Business Lab programme. The Business Lab is designed to detect, test and transform opportunities into new activities, including outside its core automotive market, in response to rapid growth in new ways of using cars.